Davis, California – November 26, 2007 – On November 20th the California Dairy Quality Assurance Program (CDQAP) became one of a select group of organizations or projects to receive California’s highest and most prestigious environmental honor, the Governor’s Environmental and Economic Leadership Award (GEELA). The CDQAP received the award in the category for “Environmental and Economic Partnerships”, having demonstrated exceptional leadership in building public-private collaborations helping conserve California’s resources and protecting and enhancing the environment. “I’m proud to honor this year’s award recipients for their sustained commitment, innovative solutions and strategic investment to protect our environment and boost our economy,” said Governor Arnold Schwarzenegger. The CDQAP comprises 17 regulatory agencies, dairy organizations, environmental advocacy groups and the University of California. The partnership offers classroom and on-farm assistance in meeting regional, state and federal environmental regulations. Making sense of these complex regulations and providing outreach to the state’s nearly 2,000 family dairy farms requires leveraging financial, personnel and technical resources of each of the partnering organizations. With new air and water regulations being promulgated or modified, the CDQAP has responded by offering a variety of courses, some statewide in scope and some specific to particular regions. Producers frequently take more than one class. Since the program’s formation in 1997 some 2,400 producers or dairy advisers have attended one or more CDQAP classes for a total of more than 8,400 classroom contacts. The CDQAP reaches dairy producers through a variety of other methods including Web pages, newsletters, alert bulletins and symposiums and advisory board presentations. Information from the CDQAP is also made available for industry, university and regulatory publications. Because class curricula and materials are developed collaboratively with the regulatory and academic experts, dairy producers have come to trust that finding the CDQAP logo on materials means that they are getting concise, factual and timely information. The CDQAP also offers producers the opportunity to prepare for and undergo a third party environmental compliance evaluation. To date 256 dairies have successfully completed these on-farm audits. CDQAP partners include the US Environmental Protection Agency, California Environmental Protection Agency, California Department of Food and Agriculture, California Resources Agency, State Water Resources Control Board, California Department of Fish and Game, USDA’s Natural Resources Conservation Service, Milk Producers Council, California Dairy Campaign, Western United Dairymen, California Farm Bureau Federation, the California Milk Advisory Board and Sustainable Conservation. While core funding has been provided for a decade by the California Milk Advisory Board, other partners including US EPA and the California Department of Food and Agriculture have been generous with grants and other in-kind support. 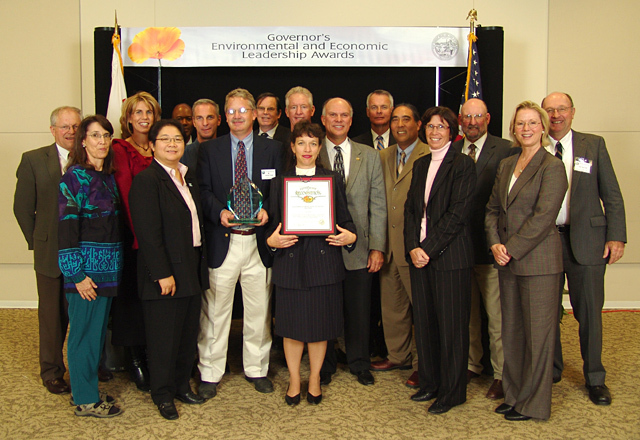 The Governor’s Environmental and Economic Leadership Awards program was established in 1993. Recipients are selected by a large panel of evaluators and the Secretaries of Cal/EPA, the Resources Agency, Business, Transportation and Housing Agency, the Department of Food and Agriculture, the State and Consumer Services Agency, and the Governor’s Office. For more information about GEELA, visit the Cal/EPA Web site: http://www.calepa.ca.gov/Awards/GEELA/.